Located in the Kodagu district in Karnataka on the banks of the River Cauvery is Dubare Elephant camp. 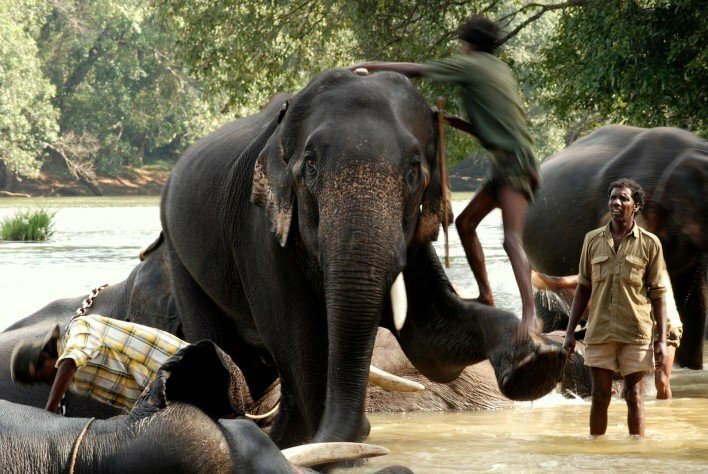 Dubare elephant camp is one of the major camps Elephant camps in Karnataka over the 150 other camps. The camp lures many travelers and elephant lovers to the camp. The only place where one can get a closer touch of the giant animal. The stay and fun with the elephants would make an ideal trip amidst the thickets of the trees and cool springs. The camp is not just for visiting elephants, but also lets the tourists enjoy rafting, trekking, fishing etc. Trained naturalists are available to explain the various aspects of an elephant, their behavior etc. Tourists can take part in activities involving elephants and observe and learn. Most of the elephants trained here are used for the Mysore Dasara festival. Tourists can opt for residing inside the camps which contain many cottages. The small and elegant cottages are enough for a comfortable stay. Tourists can learn and interact with the nature specialists and get to know more about the elephants and the various flora and fauna of the forests. The rich wildlife is a spectacular watch. The evergreen deciduous forests are home to many kinds of wild animals and birds. The place is ideal for bird watchers. The elephant camp lets the tourists enjoy the sight of elephants bathing, eating and doing other activities nearby. The tour would be like camping with the big giant elephants in their natural habitat. The interesting location of the elephant training camp on the banks of the River Cauvery is ideal to spend a day. Tourists can enjoy jungle rides on the elephants, which is indeed an experience. One can see the Asian elephants playing in the water and then showering with water using their trunks, playing with dust etc. Other than watching the giant elephants the visitors can also spot many peacocks, sambhar moving in herds to the river banks. There are numerous varieties of birds and chirping around. You can go for a jeep safari to enjoy the wildness of the forests. The wildlife shows here, let the visitors know more about the wildlife. Visitors can even scrub and bathe the elephants. Tourists can enjoy a Sailing on the Cauvery River in a coracle. Learning from the naturalist on the various aspects of nature, history and all about the elephant’s biology as well as ecology would be perfect experience in the camp. Visitors are also facilitated on how to feed an elephant and the different types of food that elephants like. Bird life here in Dubare is a treasure house of peacocks, kingfishers, partridges etc. Other animals found in the forests are tigers, sloth bears, Indian Bison, bears, crocodiles etc. Elephant Rides Timing: 10 AM – 12 PM and 4 PM – 5 PM. Rohu and Mahseer fishes are popularly found in these Cauvery waters. The Valnoor Fishing camp is a storehouse of these fishes. The catch is only permitted for taking photographs. The fish should be tossed back into the waters. Special fishing permissions must be attained from the authority. The hunt is strictly prohibited. Rafting is an adventure sport which many of the tourists prefer to enjoy the ride on the river as well as catch a glimpse of the amazing river and wildlife of the forests on the banks of the Cauvery. The wide river has fewer rapids hence rafting is quite convenient. Choosing the right rafting option depends on the water level. During monsoon seasons the water level is quite high. Walking deep into the forests to discover the natural habitats of these wild animals would be an ideal way to discover the pulse of the forests. Exploring and discovering Dubare through trekking is an excellent choice following the valleys, hillocks, river banks, forests etc. will let the tourists enjoy the deep dense forests. The Big stone hill or Deddakalbetta is a perfect spot to enjoy the perfect sunset. The Fishing spot to Big stone is a short trek. Adventure lovers can opt to go deeper into the forests towards the oldest Ganapathy temple inside the woods. Guides are available to help tourists explore the unknown places. Dubare is accessible by road, air and train. Mangalore airport is the nearest airport (180 km) and Bangalore (230kms). From here oen can reach Dubare by road. Mysore railway station is the nearest (100 km). Avail a taxi to reach the camp from the station. The camp is accessible from Bangalore via Mysore, Khushalnagar and Sidhhapura.